Summer in Japan means hot, humid days and rain, lots of rain. Tokyo swelters through two to three months of steamy, draining days. In 2005 the Japanese government introduced Cool Biz. Cool Biz is a slightly more casual dress code that was adopted by government departments as a energy saving program. Air conditioners in government buildings were set at 28 degrees during the summer of 2005 and government workers were allowed to wear trousers with a much lighter material, they were also allowed to work without wearing a tie or a jacket. In subsequent years, Cool Biz caught on in the private sector also and today, most, if not all companies use the Cool Biz dress code during summer. This makes summers a little more bearable, but only a little. Summer time in Japan is also typhoon time. Typhoons often start forming in July and continue through until October. Early in the typhoon season, they rarely venture north of the southern islands of Okinawa. Later in summer as the prevailing winds pick up and start blowing from west to east, typhoons then follow these winds and blast their way over the main islands of Japan. The big cities are able to withstand strong typhoons but in the country areas and especially areas that are mountainous, typhoons can do a lot of damage. There was a large typhoon that slammed into Oshima island (located south of Tokyo) in October last year. In a 24 hour period, Oshima island received a massive 824mm of rain (I come from a very dry part of Australia where the average yearly rainfall is 546mm, so I was stunned when I saw those numbers!). During that typhoon, there were huge landslides on the island resulting in over thirty deaths. 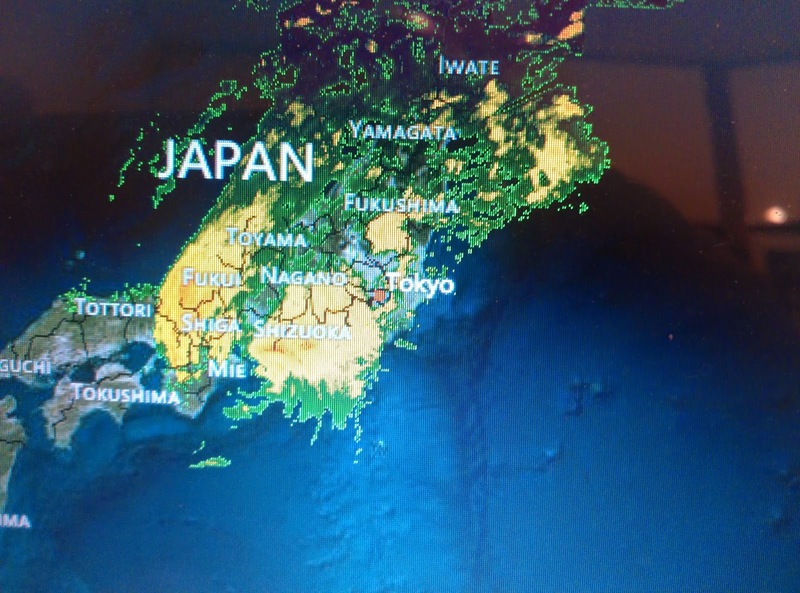 I am sitting at home at the moment and the first typhoon of the season to pass directly over Tokyo is approaching. The Japanese F1 race was luckily able to be run this afternoon just before the typhoon arrived. The main part of the typhoon is due to be over Tokyo early tomorrow morning and as I have a day off tomorrow, I will stay up and wait for it to arrive and then pass over. I thought it might be interesting to write updates during the night as it arrives. I know some of my Japanese readers are probably thinking "What??? Why???". Well, I come from a part of Australia that is not affected by cyclones and the first year I was in Japan, the first typhoon that came along had me intrigued. During the middle of the typhoon I walked outside just to see what it was like! I am doing this as there are probably some people who read this blog who maybe wonder what being in a typhoon is like, just like I did (if my Mum is going to read this, Mum, don't worry, I will be careful!). One of my coworkers actually suggested that I spend the weekend doing a blog post on how to survive a typhoon, so here we go! It is now about 5:45pm and it has been raining steadily pretty much all day. Outside it looks pretty unremarkable, wet roads, but that's about it. About an hour later I decided to head to a nearby bar to watch my favourite football (or soccer depending on where you are from) team play. By that stage, the rain had intensified a a bit and there were occasional gusts of wind. Good news, thanks to an amazing display by the goalkeeper, my team won 2-1. If you know which team I follow, you will know how much of a relief that is!! During the game, the rain got quite a bit stronger and on the way home, I shot this update. Not a whole lot of change. The rain had actually eased a little compared to during the game but from what I have experienced with typhoons here in Japan, that is quite common. The literal calm before the storm I guess! Don't get me wrong, I am far from a typhoon expert. I have lived in Japan for about 5 and a half years, and have experienced probably a couple per year during that time. I am sitting here in my room and it is about 2am. I have just read some news that 3 US Airmen were washed out to sea in Okinawa by the storm surge created by the typhoon. There are always (unfortunately) some people who put themselves too close to danger and as a result, the typhoon has claimed it's first victims. The rain has just intensified a bit here in Tokyo. The wind is not yet too strong and the typhoon is still a few hours away. Apparently some parts of Japan are expecting to receive over 300mm of rain over the course of the night. That's a lot of rain! I will probably poke my head outside sometime soon and see what it looks like. Well, hunger eventually got the better of me and I decided to head to the convenience store for a snack. I stated on this next video that it was about 5am, it was actually about 4am. I took a couple of videos while I was out. Initially it appeared as though conditions had eased. About five minutes later, it had started to get worse again. At 6:35am, it's finally about to hit. And as I uploaded this photo, the rain picked up again. Thunder and lightning had started about an hour ago. It is now about 8am and the rain has picked up in a big way again. The wind has also picked up a little too, and I am sure that will continue to rise. The good news (?) however is that there is another typhoon approaching, so I hope I can film that one and finish this blog post. Fingers crossed! but, all things considered, it was pretty tame. Apart from the occasional gust of wind, it seemed as though the typhoon had passed and that I had missed another one! I took a couple of quick videos. The wind sounds worse than it really was! So I went back home and was sitting inside disappointed for a couple of hours and then I started to hear the wind start howling through the trees just outside my window. At first only from time to time. As time went on, it became more frequent until I felt I had to step outside to check again. At ground level, however, it wasn't so strong, but looking up at the tree tops, was where the action was, the trees were swaying and shaking constantly. I decided that where I was was probably a little too sheltered and walked off in the direction of a large freeway near my house. Here the trees up above were feeling the full effects of the wind. Walking along the street there were so many signs of people who had tried (with inevitable consequences) to keep themselves dry in the typhoon! Now, every time I walked past a gap between buildings or a side street I got blasted from the side by the wind. It was difficult walking in a straight line! I cam across a flag that was fighting a losing battle to stay on it's pole. In this next one, the wind is so strong you can't even hear what I am saying on the video! It was at about this time that I decided I should probably make my way home so I walked back hoping that the power lines above my head would stay there! Thankfully they did and I made it back safely! There it is, we made it through a typhoon (2 really!). As I said at the start, they are not as dangerous in the city areas compared to the country and mountainous areas and I was probably lucky that this one had lost a bit of strength as it reached Tokyo (and the eye also passed north of Tokyo too). Thanks again for reading. I hope all of the video works, this is the first time I have uploaded video to the blog! Konnichiwa Jason san(by the way,do your students.or Japanese friends use Jason san to you? ).The cover photo seems to be taken at Ogimachi...one of the most beautiful places I visited whilst in Nihon. Although typhoons are common in Japan, they would no doubt be we well controlled in Tokyo;although it would be only natural that from time to time flooding and power blackouts would occur.In the last month , we have had two very windy days...with events cancelled on the Monday long weekend.Winds reached around 100 kmph. The videos worked just fine! As you would know by now,Paddy Ryder is gone,but getting Cooney(an Adelaide boy) will add a bit of sting to the centreline.Giles the ruckman,could be a bonus.Overall,I expect the side to improve on last year.Nice to see Fletch. go around one more time! With winter approaching,I was wondering if you might head to Niseko...apparently lots of Aussies go there during the snow season,where I believe the snow is as good as anywhere in the world. Weather conditions here are heating up and the hills are dry as a bone.Fire bans have been put in place for this coming Monday. Well Jason, can forget footy for a while and keep our fingers crossed for a better season next year. It will interesting to see how Paddy settles in at his new club! good to hear from you again. I make sure my students don't call me Jason san more than once. I do this as part of teaching them what to call people in Western society. I think that the sooner they know how to refer to another person in English speaking countries, the better, especially as most of my students are business people, but yes, it does happen from time to time! The top photo was taken at the Ogimachi area of Shirakawa-go. It definitely took my breath away while I was there! Typhoons don't have much of an affect on Tokyo. That's why I felt pretty safe heading out into the typhoon to take the video. I saw that Paddy made his move and that we got Cooney. I just hope Cooney's injuries are behind him. I also see today that ASADA are ready to issue the show-cause notices to the players again. I just want for this whole issue to be over so that the players can simply focus on Footy. Take care Noel, and speak again soon.